GTRIBE, the world’s most advanced network for tech enthusiasts and PC gamers, has partnered with EK Water Blocks, XFX, NZXT, Seasonic, Logitech G and Voidu for a pure giveaway experience! Radeon RX 590 graphics bring the latest and greatest features for PC gamers everywhere: capture, stream, share, optimize and fine-tune your games with ease. Exceptionally smooth and fast out-of-the-box gaming experience powered by Radeon Software. The best part? We’ll keep working to improve your experience with free, regular software updates. Radeon Chill is an intelligent power-saving feature for Radeon graphics that dynamically regulates framerate based on your movements in-game. During peak gameplay, Radeon Chill works to deliver the full framerate potential of Radeon graphics. As movement decreases, Radeon Chill reduces your gameplay framerate. Designed to save power, lower temperature, and increase GPU life, Radeon Chill enables high-performance graphics when you battle and saves power when you explore. The list of the winners is published online and all participants are notified by email as to the location of that list. 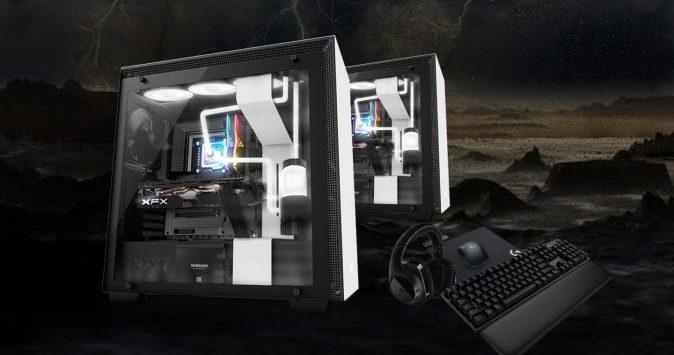 2 x fully loaded gaming PC, handcrafted in Texas by EKWB. This pure performance PC is rocket-powered by an Intel Core i7-9700K processor expertly liquid-cooled by EK Water Blocks, and hyper-driven by an XFX Radeon RX 590 FATBOY GPU. This incredible gaming PC is also beautifully encased in a white / black H500i chassis by NZXT and augmented by the latest Logitech G gear.